As the economy continues on its upwards trajectory, the unemployment rate continues to fall. This is great news! It’s always a positive when more people can find meaningful work. But, as the employment rate continues to rise, companies are finding it more and more difficult to hire the skilled workers they need in the most competitive employment sectors. As Judge President Brian Anderson pointed out a few months ago, the demand for blockchain professionals is rising, as is the cost of hiring and scaling. This is a problem that goes beyond blockchain professionals. Nearly every company hiring in emerging technologies, whether that’s blockchain, machine learning, or artificial intelligence, are facing a qualified worker shortage. This causes a revolving cycle of recruitment, onboarding, training, and backfilling that is both time intensive and costly without the benefit of long-term results. What can you do to combat this cycle of constant recruitment? Another approach would be to identify candidates on the job market who possess some, but not all, of the required skills and train them to grow into the senior level position. This approach has many of the same benefits as training internal candidates and also offers the opportunity to recruit for specific hiring goals, whether they be geographic, diversity, or veteran specific. Training internally or identifying talent in the market has another soft bonus: curb appeal. What does that mean? Well, one of the most sought-after benefits job seekers are looking for in a company is training. If your company is showing a willingness to invest in employees, or train up new hires, you are making yourself more appealing to job seekers. This is a nice add-on in addition to normally offered benefits and can give your company a leg-up on others when attempting to attract top talent. 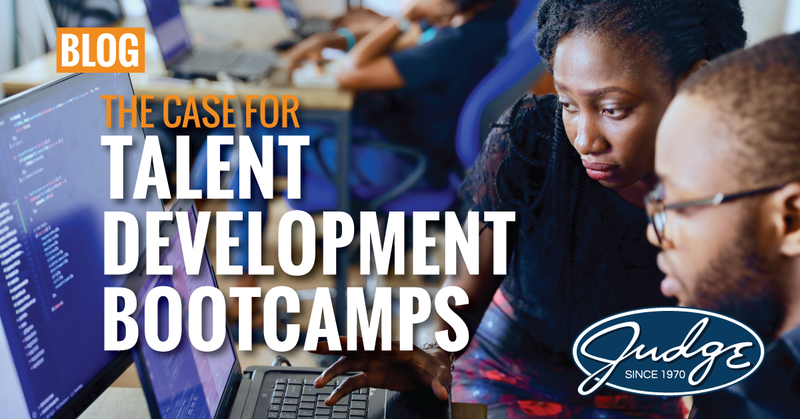 By utilizing Talent Development Bootcamps to train up internal employees or identify & train-up talent in the market, you can use a tight labor market to your advantage. You not only get the technical talent you need with the benefits listed above, but you position your company as a desired destination for skilled workers. Interested in learning more about Talent Development Bootcamps? Fill out the form below and a member of the Judge Learning Team will reach out to you shortly.